Sometimes, when researching a column or even a post, a view into a slice of life from the past will emerge. Today’s ‘slice of life’ comes to us from late 19th-century Bath, Maine. As November wore on in 1895, skunking became popular in town. 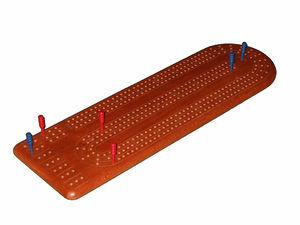 Being a card player, ‘skunking’ makes me think of cribbage – specifically, winning a cribbage game by more than 30 points (or by more than 60, which qualifies as a double-skunk). The men and boys of Bath, Maine, though, had a different activity in mind. Skunking, to them, meant gathering together poles and guns, and a couple of lanterns, and setting off to hunt down skunks of the black-with-white-striped variety. They soon discovered that guns left quite a mess; so, the preferred way to skunk was with, of course, a ten-foot pole. 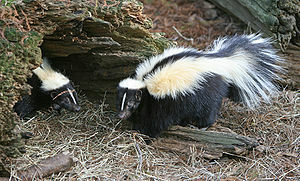 Besides ridding Bath, Maine of its native skunk population (skunks were viewed as pests), they could then sell the skins for $1 to $2.50, and even sell the oil. The skins, when dressed and dyed, were considered quite fashionable. “Fall Fun.” The Bath Independent. Bath Me. 16 Nov. 1895, 3.